It’s raining when we leave Whitehorse. 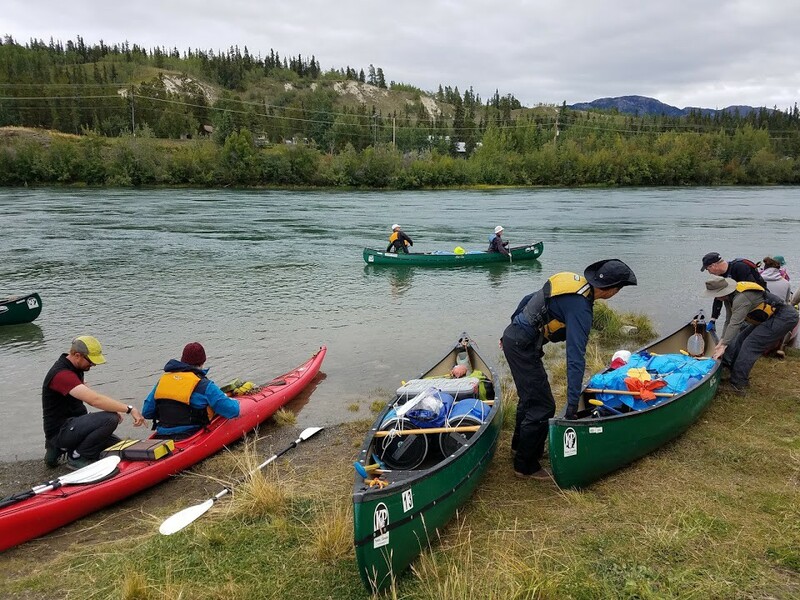 Our six vessels slip into the Yukon without finesse: five canoes, one kayak, and only two paddlers (not us) with real river experience. The Yukon is a mild river, in this season. There’s only one set of real rapids, and it’s next week. Most of the troublesome spots were dynamited out back when sternwheeler steamships carried fortune seekers this way. Friday was the last day of the orienteering championships. We didn’t linger after our races for the usual banter and route comparison with our competitors; short on time, we bused back to downtown Whitehorse to shop for supplies. I’m used to backpacking, where weight and volume are both in short supply. But we can fit two 60-liter barrels into each canoe, and the river carries the load. We’re even renting a kitchen set with pots and pans from our canoe outfitter. Rick snags the last carton of mushrooms in the store. I can’t help but shake my head at the irony of seeing (once again) only the produce that will keep. After a month at the Sunnyside cabin, Whitehorse felt like a place where you could get anything. But we’re still remote, even in the big 30,000 person city. Where we’re headed is wilder yet. That 30,000 is three-quarters of the population of Yukon Territory. We’re setting out to cover 750 road-inaccessible kilometers by paddle. We load our groceries into our backpacking packs, walk the twenty minutes to the canoe rental, pre-load gear. One last night in Whitehorse, then we’re on the river in the morning. The water is a clear green, the river shallow. We can see the stones of the riverbed speeding by below us when the surface is still. Whitehorse suburbs and outbuildings taper away on the bluffs. A bench here, a seaplane dock there. A coyote watches us from high above, jogging through the trees to peek again and again. The highway sound fades. Bluffs give way to trees. There’s an airfield on the map, but we don’t see it. Then, it’s just wilderness.